Primary Camp is held annually at the Kiwanis Camp in LaGrange. This is a camping experience with our younger members and a leadership development experience for our intermediate and senior members. Parents and other family members are invited to share this great time. Primary Camp counselors are to be 12-14 years old and in 7th or 8th grades (6th graders will be considered, if there is a need). 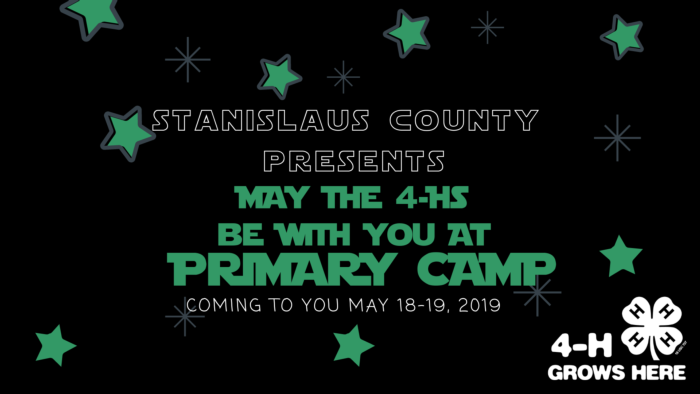 2019 Theme: "May the 4-Hs Be With You at Primary Camp"
NEW DATE--Primary Camp will be held May 18-19, 2019. Counselors and staff arrive on Friday May 17th. DUE MAY 1st from the Club Leader. Counselor applicants are to submit this form to your club leader by your March Club Meeting. Club leaders will return form to the 4-H Office on or before March 13, 2019. Minimum requirements: 12 years of age by December 31, 2018 and enrolled in 7th - 8th grade. (However, 6th graders will be considered, if there is a need) Interviews: April 5, 2019. If you are a 4-H member in high school and are interested in a camp leadership position please contact Jennifer Hill at 537-0977. Primary Camp Staff meet 4-5 times to plan all the activities for the upcoming Primary Camp.